Sometimes you have to learn about drinking the hard way: through reading. But the good news is whether you want to learn about the intricacies of a specific spirit, specialty cocktails or drinking culture, there are a plethora of books available for those with a thirst for knowledge. Here are 10 great books that are sure to enrich your liquor lexicon and bring you a greater appreciation of the wonderful world of premium spirits. With the recent rediscovery of the craft of whiskey and the worshipfulness that goes with it, it is easy to forget the commercial and marketing aspect of what is one of America's great culinary gifts. Since the birth of branding, beautiful labels and arresting advertising images have been created to sell the liquid that goes in the bottle. With The Art of American Whiskey: A Visual History of the Nation's Most Storied Spirit, through 100 Iconic Labels (Ten Speed Press, $19.99), Noah Rothbaum follows the endearing history of how the great whiskey peddlers of America enticed us to try their products in the first place. Natural scenes, patriotism, frontier heroes, folkloric heroes, medicinal claims: very little was off limits for marketers looking to hawk their hooch. But this book isn't limited to commercial imagery. It's also a valuable history of the country as a whole—not to mention that it includes some pretty good cocktail recipes. While Bacardi has made an indelible mark on the world of cocktails with its many rums, the family-owned spirits giant has also left an undeniable impression on the landscape of the world since its founding in 1859. Allan T. Shulman's Building Bacardi: Architecture, Art & Identity (Rizzoli, $60) traces the company's history via the interesting mix of edifices it has constructed along the way—from distilleries and bottling plants to exhibition bars, museums and corporate headquarters. The mélange of styles, detailed in 200 photographs, represents a pantheon of architecture, including Ludwig Mies van der Rohe, Philip Johnson, Henry Klumb, Enrique Gutierrez and Félix Candela. Building started in Cuba, but now spans the globe, with Bacardi not only represented in Puerto Rico, Miami and Bermuda, and more far-flung places, but with its acquisitions of Bombay Sapphire, Dewar's and Grey Goose, throughout Europe. Also, included are fascinating vintage ads and art commissioned from such names as Maxfield Parrish and Johannes Dietz. Be honest. Who among us, even the nerdiest of cocktail geeks, has never thought: "I don't care about any homemade bitters or where you sourced the water to craft the tonic water or how you were up all night mincing the heirloom herbs. I just want a drink—and I want it now." The joy of simple drinking is the premise behind Jennifer McCartney's Cocktails for Drinkers: Not Even Remotely Artisinal, Three Ingredient or Less Cocktails that Get to the Point (Flexibound, $14.95) Even while every one of these drinks cuts to the chase, they are no less classic in the world of liquor mixing. Included are old standbys like the Daiquiri and Rum & Coke, set alongside more ambitious undertakings like the Harvey Wallbanger and the Negroni. The commonality is they can be done fast. Sprinkled with good advice and irony, it's all done in good fun. Case in point, the recipe for Red Wine: "This Red Wine is made with red wine. Makes one large drink. [ingredients] 1 bottle red wine. You know what to do." You think of drinking in Cuba and what jumps to mind? Daiquiris and Mojitos, or maybe a Hemingway cocktail. Part recipe book, part travel log, part tribute to Cuban culture, Cuban Cocktails: 100 Classic and Modern Drinks (Sterling Epicure, $24.95) delves far deeper than the tropical drink surface. There's a lot of history here as well as valuable technique tips. Predictably, recipes are dominated by rum. All the same, be prepared to encounter rye, Cognac, Chartreuse, Benedictine, applejack and much more in the mix. Coming to you from the folks at Manhattan's rum bar Cienfuegos, the book cleaves to an old-school sensibility of mixology, stating: "Unlike in America, Cuban cocktail culture never dissolved into a dark age of convenience aimed at easier, faster, sweeter intoxication." If heavy drinking could be equated to real estate, the subject of this book—a single, bar-filled block of San Francisco's Barbary Coast from the 1870s-80s—would be an apt place to start. Drinking the Devil's Acre: A Love Letter from San Francisco and her Cocktails (Chronicle Books, $24.95) is the paean of local bartender and educator Duggan McDonnell. Interspersed with the 25 cocktails made famous by the city, the author tells the story of the birth of its illustrious drinking culture, which came to us kicking and screaming from the salty denizens at the heart of a municipality that once boasted one bar for every 96 inhabitants. The baton was passed down through Beat characters like Jack Kerouac and Neal Cassady and now rests safely in the hands of some of the best wielders of Pisco and amaro you'll find in the world. After a long low period, gin has returned to the esteem of the modern cocktail culture. And who better to welcome it back then Dave Broom, the Whisky Advocate contributor and author of Whisky: The Manual? He follows the format of the latter in Gin: The Manual (Mitchell Beazley $19.99), first parsing the many kinds of gin—Dutch, London Dry, Plymouth, Scottish, Spanish and American—explaining how they are made and what distinguishes them, before examining specific brands. There's ample history from gin's 15th century roots through the days of Dutch courage to William Hogarth's Gin Lane to the Gin Acts and the rise of the cocktail. Broom even connects the spirit to his very existence. What makes this book indispensable is the review section, with more than 120 gins, tasted neat as well as in a Gin & Tonic, with lemonade, in a Negroni and in a Martini. Author Tim Federle again gets points for clever cocktail book naming. His previous two books (Tequila Mockingbird and Hickory Daiquiri Doc) spoofed literature and nursery rhymes, respectively, in making punning titles for drinks. Now Gone With the Gin: Cocktails With a Hollywood Twist (Running Press, $15) takes aim at the silver screen. The 50 recipes are twists on familiar recipes with names from movie titles. The Muppets Make Manhattan, for instance, is an apple brandy Manhattan. The Dirty Harry Martini is flavored with pickle juice. Don't expect much connection to the film other than the pun. The 7&7 Year Itch is a blended whiskey highball, not the Whiskey Sour mentioned in The Seven Year Itch. The Big Le-Brewski comes closest. It's a fresh brewed take on the White Russians that The Dude drinks in the movie. The name of the cocktail is specific to a borough of New York, but it's a drink that's gotten around quite a bit. Philip Greene's The Manhattan: The Story of the First Modern Cocktail (Sterling Epicure, $19.95) demonstrates its ubiquitous qualities quite handily. From O. Henry and Dashiell Hammett to John Dos Passos and Kurt Vonnegut, you can read about this sublime meeting of whiskey and vermouth. It went on to co-star on the silver screen alongside the likes of Marilyn Monroe, Jack Lemmon, Frank Sinatra and William Powell in The Thin Man films. And that's just the fictional characters. Real-life politicians, celebrities and just dedicated drinkers the world over have enjoyed the "first modern cocktail." Between various "creation theories," a range of great recipes, numerous anecdotes and some very clever writing, the author makes a very good case that the Manhattan deserves that lofty title. You'll want one at hand as you read. The Waldorf Astoria Bar Book (Penguin, $25) will keep a cocktail-loving dad busy for a long time and show him not only how to craft serious drinks but how to prepare a home bar. Author Frank Caiafa, who manages the Waldorf Astoria's bar called Peacock Alley, spent five years researching this fat tome, which is the first update of a Waldorf Astoria cocktail book since 1934. There are more than 1,000 recipes from which to choose. One that caught our eye? The Globetrotter, a concoction mixing 1.5 ounces of dark rum, 1 ounce of amaro, and 1 ounce of Oloroso sherry, served in an Old Fashioned glass. Caiafa writes: "it pairs extremely well with a cigar." This tome starts with the author's declaration that he's downed lots of sophisticated tipple in many plush situations, but he's never been "too fancy to drink a boilermaker." That confession about a cocktail that's simply a pint of beer and a shot of whiskey pretty well sets the tone of the book. 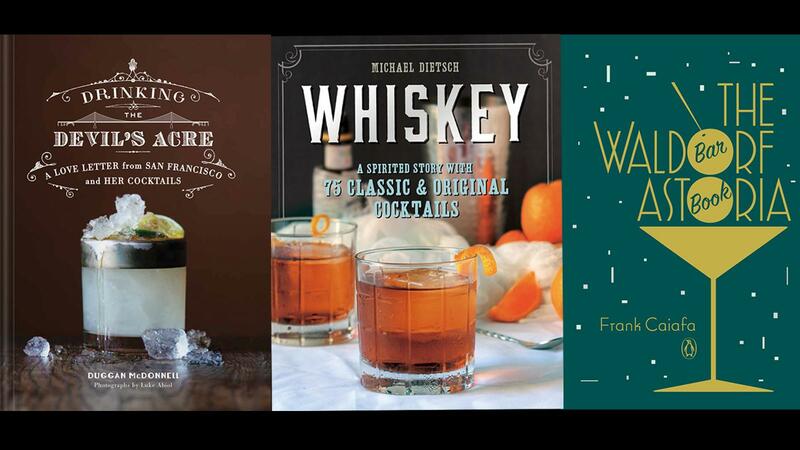 In Whiskey: A Spirited Story with 75 Classic and Original Cocktails (Countryman Press, $24.95), author Michael Dietsch can get as intricate as you like (with a treatise on aging that explains how to make a barrel), but has no qualms about telling you how to make cocktails with that precious, aged whiskey. Filled with anecdotes about the titans of the whiskey world, it also divides the history of brown cocktails into five eras. A bottomless bottle of whisky having not been invented, the gift that keeps on giving for a father who is a lover of aged grain spirits is a subscription to Whisky Advocate magazine (from M. Shanken Communications, the publishers of Cigar Aficionado). For more than 20 years—long before the whisky boom began—it has been the impeccable source of knowledge and insight. Editor John Hansell and a cast of illustrious contributors regularly take readers on a worldwide tour of the whisky landscape. Coverage includes stalwarts like Scotland, Canada, Ireland and the traditional American Bourbon/rye region, as well as newly minted craft distillers and less well-known distilling venues such as Japan, France and India. Feature articles provide education, and numerous reviews of new expressions keep readers up-to-date on the ever shifting whisky market.